Imagine a scenario when you’ve just missed the last train and are stuck all alone on the streets of Tokyo. What to do? Simple book a sleeping pod at the compact capsule rooms! Capsule hotels are fast becoming a convenient option for most urban dwellers who want a cheap yet comfortable hotel to crash in for the night. An accessible, affordable and practical accommodation, these hotels are quite popular among tourists as well. However, for all its minimalism, capsule hotels can be a unique experience for solo travelers. Capsule hotels have been around for a long time now with the first resort established sometime in 1979. The rooms feature bunk beds, in-built TV, lights and other basic amenities required for your stay. We have compiled a list of the top 10 capsule hotels in Tokyo where you can unwind after a hectic day. The next time you’re in Tokyo for business work, choose one of these practical capsule hotels. The do-c Ebisu is 24-hour capsule accommodation located within a 1.5km radius in Ebisu Garden Place, Tokyo. Equipped with a Finnish style sauna, compact bunk beds, free Wi-Fi and AC, the place is perfect for short-term business trips around the city. Here, guests can relax in the saunas after a tedious day of exploration. The hotel is well connected to all the major tourist attractions. All museums, art galleries, restaurants, and parks are but a few minutes’ walk away from the place. The Shibuya Town Centre is a 20-minute drive away from the hotel, full of shopping complexes, eating houses, and venues for fun-filled activities. There are tons of things to do at do-c Ebisu, you can either explore the city or just stay indoors and read comics (the place has an amazing collection of vintage comics). The do-c Ebisu capsule hotel has about 162 rooms and doesn’t entertain minors, pets, and infants. Also, there’s no parking facilities and in-house dining. The property is a non-smoking zone, so chuck those cigarettes away before you enter the building. The capsule hotels in Tokyo are mostly unisex; however, some are exclusive to men only. The Sauna New Century is one such place where men can come in and enjoy a steamy sauna with free drinks and food at really affordable prices. Located smack in the middle of the city, the place is just a 5-minute walk away from the JR Uno Station. Even the Okachimachi Station is but a 3-minute walk. Other than that, the hotel is also well-connected to the Ueno Park, Tokyo National Museum, and the National Museum of Western Art. The tourists will especially enjoy the excursions to places like Asakusa, Akihabara and the Tsukiji Fish Market. The accommodations are equipped with on-site hot tubs, vending machines, free Wi-Fi, and a spa. The capsules feature bunk beds or pods, a TV, radio, an alarm clock and AC. Taito is a great choice for travelers who love sightseeing, long walks around the city and temples. The Grandpark Inn in Kitasenju is located in the heart of the Adachi district in Tokyo. The Adachi ward is the ideal destination for all travelers who love exploring the oriental cultures, enjoy sightseeing and city walk. All the major motorways, stations, and airports are but a few minutes’ drive away. Kitasenju Station Nakamachi is only 5-minute walk away, while the station’s exit 1 opening to the Chiyoda Line is only a 2-minute walk away. The Tokyo Sky Tree Tower is 4.1 km from Grandpark Inn Kitasenju, even the Edo Tokyo Museum is 6 km away. The nearest airport is Haneda Airport; it takes an hour to get to the hotel. The capsules feature round the clock reception, shared microwave, hot saunas, public bathing areas, and smoking rooms on the 3rd floor. The lobby is comfy, vibrant and well stocked with Japanese comics. Each pod has a small bunk bed, flat-screen TV, complimentary toiletries, a private locker and free Wi-Fi. Set in Tokyo, the Glansit Akihabara is what we call the ideal accommodation for budget travelers. The place, though centrally located, is available for inexpensive rated, and hence is a popular choice for businessmen, teens, young couples and solo tourists. It is about 2.2 kilometers from the Edo Tokyo Museum, the Manchouri Building, and the Japan Imperial Palace. The rooms are all compact, yet equipped with all the latest furnishings. Simple, practical and very minimalistic, the pods or capsule suites have bunk beds, inbuilt wall TVs, a radio, an alarm clock, and common bathroom with free toiletries. If you love temples and museums, then the Glansit Akihabara is the perfect destination for you. The place is pretty close to the Sensoji Temple, Yasukuni Shrine, and Chidorigafuchi. International guests find the Tokyo Haneda International Airport (about 15kms away) to be the nearest and most convenient option. You can also explore the Chiyoda for greater insights on Japanese culture and local life. Capsule hotels were originally established only to cater the needs of men. The overall construction of the hotel was pretty basic and didn’t have much aesthetic appeal. With time, many of the capsule accommodation facilities opened up to both the sexes; however, some choose to offer their services exclusive to the male population. The pods or compact chambers are known for their privacy; you get all the amenities inside the room itself. The Common Shibuya is located in the Shibuya district of Tokyo, about 500m from the Hachiko statue. The capsules are furnished with small but comfy beds, a flat-screen LCD TV, radio, lockers and free internet connectivity. The shared bathing spaces, saunas, and spas are open to all men staying in the hotel. Also, meals are served on the hotel property in the nearby restaurants. Commun Shibuya has a 24*7 reception service and even arranges for tours around the city. The Shibuya Centre Town is just 2kms away, while the NHK Park Studio is about a minute’s walk from the hotel. First Cabin Akasaka is one of the finest capsule hotels in Tokyo and is a minute walk from the Akasaka Subway Station on Chiyoda Line. This modern-day accommodation is extremely convenient for solo travelers and businessmen who just want a simple and accessible hotel for a night or two. At First Cabin, the lobby features vintage vending machines, laundry services, and a mini-bar. The 24-hour help-desk service is armed with a team of friendly and multilingual staff. If you love sightseeing, the city has a lot to offer. Guests can check out the National Diet Building and the JR Tokyo Station, both a 16-minute ride away from the hotel. The pods or compact suites are equipped with bunk beds, a side table, wall-hanging LCD TV, a radio, lockers, alarm clocks, free Wi-Fi and many other facilities. The units also include a common lounging area and shared bathing space. Complimentary breakfasts, free toiletries, and the internet make First Cabin a practical and private accommodation option for people in Tokyo. Now, most capsule hotels were established keeping in minds the needs of men. What about the women? Isn’t it only fair that even the women should have an exclusive accommodation option in the city of Tokyo? Well, that’s what the people at Omotenashi no Oyado thought of. 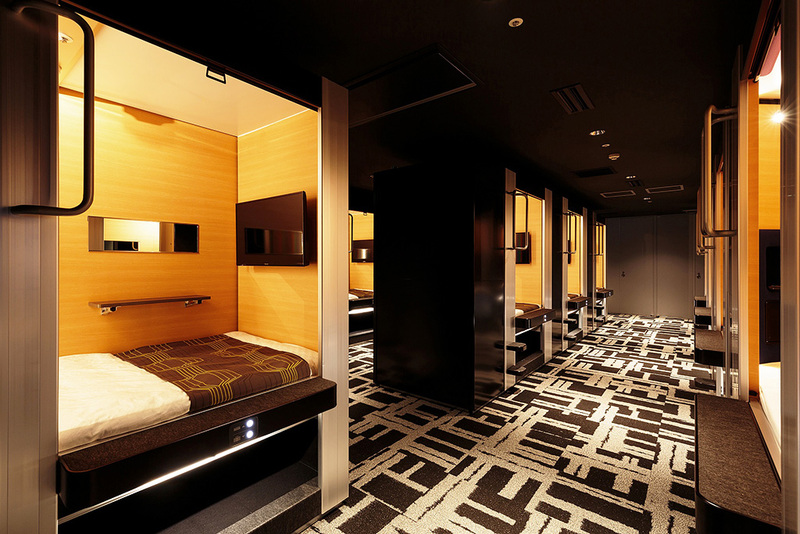 The capsule hotel has separate sections for both men and women. The compact rooms, pods, bunk beds, shared bathing spaces and common kitchens are all very reminiscent of the hostel days. The place is just a 3-minute walk away from JR Ueno Station. Other nearby popular landmarks include Ameya-Yokocho Market, only a 2-minute walk, and Sensoji Temple, a 15-minute train ride away on the Ginza Subway Line. The capsule hotel features a public sauna and spa where guests can relax and reenergize after a long and tedious day out. Round the clock front-desk service, free Wi-Fi and luggage storage make your stay here all the more convenient. Other perks include complimentary toiletries, electronic blankets. Hairdryers, mobile chargers, and tablet computers that can be rented for free. Nine Hours in Tokyo was named after the average amount of time that a guest spends at the hotel. Most businessmen and travelers require only a simple and practical room for the night at a central location, Nine Hours seems to be the perfect choice for that. The hotel is situated in the heart of the city just 2-minutes away from the JR Shin-Okubo Station and hence very accessible to people across Tokyo. The main Shinjuku station is just a 3-minute train ride, while the Shibuya station is 10 minutes away. Nine Hours has all the necessary features of a capsule hotel. You have the typical bunk beds or pods, a TV, a radio, an alarm clock, a locker and free Wi-Fi. The bathing space and microwave have to be shared among the inmates. All the rooms have ACs controlled by a central temperature regulation system, complimentary toiletries, bathrobes, mobile chargers, tablets and other devices. There are many restaurants, bars and eating houses nearby where you can taste the best of exotic oriental flavors. Capsule hotels are all about simplicity and convenience; they usually lack the elegance and luxuries of traditional business hotels. Well, the Prime Pod changes all that. This revolutionary accommodation situated on the top of Higashi-Ginza Station is what we call a chic, contemporary hotel. The capsule resort has all the basic amenities required for a comfortable stay and much more. For instance, the pods are bigger than usual and have Seta mattresses. Also, there are private lockers, LCD TVs, cable connection, free internet, huge baths, saunas, Jacuzzis and complimentary breakfasts. What more do you need! The place is open to both the sexes and has a variety of rooms to choose from. The common lobby is spacious and equipped with an impressive collection of comic books and vending machines. Also, there’s a designated smoking area on the top floors of the property. Laundry services are available for an additional fee. Prime Pod is also located in a very prime location; it is a 20-minute walk to Tokyo Station. The nearest mall is a five-minute walk away. MyCube is the most recent capsule hotel on our list; it was opened to the public sometime in 2016. This bed and breakfast style capsule hotel is the ultimate gateway for young couples and travelers alike. The private pods and remote location give you the much-needed solitude and peace of mind. However, that doesn’t mean that the hotel isn’t well-connected to the major motorways and stations. MyCUBE by MYSTAYS Asakusa Kuramae is hardly a couple of minutes’ walk away from Kuramae Station on Toei Asakusa and Oedo lines. Tokyo Stree is also a 10-minute ride away. Other tourist attractions include the Sensoji Temple and the Edo Tokyo Museum. The compact and functional pods or capsule suites are all well-furnished with bunk beds, USB ports, flat-screen TVs, radios, alarm clocks and private lockers. The shared lounge is pretty cozy as well and has an impressive bar where people can mingle and catch up with other inhabitants. Guests can also enjoy meals at the on-site restaurant or choose to eat outside. Bathroom facilities and toiletries have to be shared though. If you want to be a part of the city and yet steer clear of the overwhelming crowd and pace, then MyCube is your best option. Capsule hotels are very different from conventional resorts. For starters, they’re a lot more compact and focus on offering only the most basic of amenities. These hotels are fast becoming a rage among budget-friendly travelers and businessmen who don’t really care much about luxuries. All they want is a comfortable room to spend the night before they catch the next train. No over-the-top services, no sign of exaggerated elegance, just plain and simple accommodation.